Locoloc® Stainless Steel Oval Sleeves make it simple and easy to lap and eye-splice stainless cable and wire rope. Ideal for general outdoor, marine, corrosive and other harsh environments. To quickly determine diameter of any cable (up to and including 3/8″ or 10 mm) this simple gauge does the trick. Merely slip it over a cable and when the cable fits snugly in the “V” slot, note the diameter printed on the gauge. 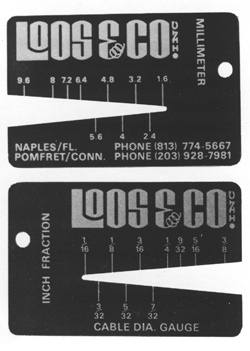 One side reads in fractions of an inch, the other side in millimeters. Very inexpensive insurance to eliminate using wrong size cable. Order several for all your workmen. Easily carried in pocket or wallet. Lightweight and corrosion resistant. These gauges make ideal “give away” items for advertising purposes. We will supply them in quantity at very inexpensive cost, in your colors and with your message. Write for details. For use on hemp, manila, nylon, dacron, cotton and all types of fiber, or synthetic ropes, bungee cord, and plastic coated cables. NOTE: We do not guarantee nor do we imply the holding strength of these sleeves be-cause the breaking strengths of the various materials on which they are used, the physical properties, tensile strengths, hardnesses, stretch factors and end uses are too vast and varied to cover all applications. We will supply samples for you to test, or will perform tests if you supply samples of material on which you wish to use these sleeves and will determine maximum holding strengths for your specific application. Length can be extended to increase holding strengths. 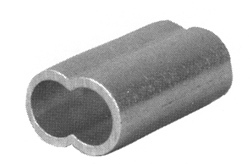 SL1-3R * 1/8″ #1-SC or 0-3/32″ or #4 1/2″ 2 lbs. SLI-4R * 5/32″ #1-SC or 0-1/8″ or #4 5/8″ 3.7 lbs. SLI-5R * 3/16″ #1-SC or 0-5/32″ or #4 11/16″ 4.7 lbs. SLI-6R * 1/4″ #1-SC or 0-3/16″ or #4 1″ 9.2 lbs. SLI-7R 5/16″ #4 or 0-7/32″ 1-1/16″ 14.7 lbs. SLI-8R 3/8″ #4 1-1/8″ 15.7 lbs. SLI-10R 7/16″ #4 1-1/4″ 28.6 lbs. SLI-12R 1/2″ #4 1-7/16″ 39 lbs.